Here's another museum artifact for your consideration. 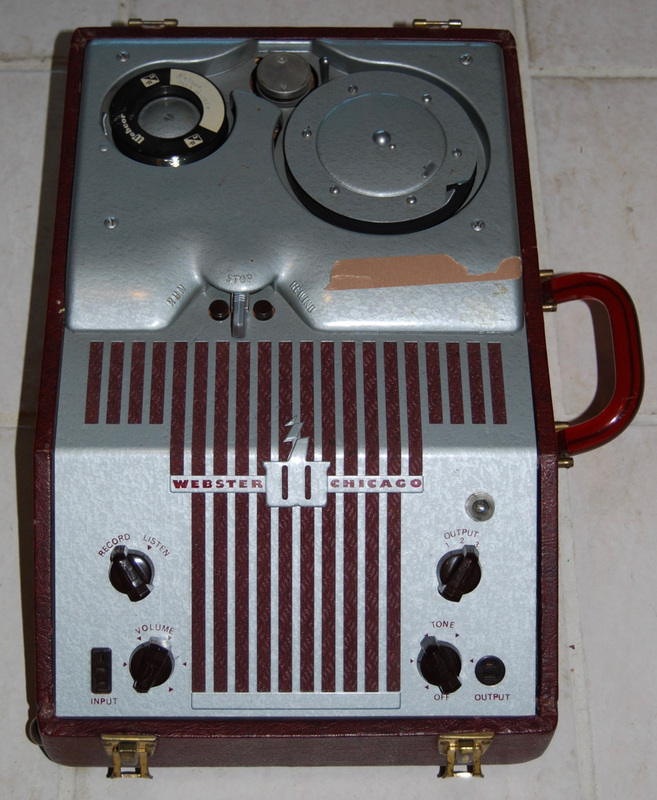 This is a Webster Chicago Model 80-1 wire recorder from the museum's collection. These were the immediate predecessors of the reel-to-reel tape recorder which revolutionized audio recording. In 1947 you could buy this Webster for $150 (about $1600 in today's dollars). The spool on the recorder contains more than a mile of very fine steel wire, onto which an hour of audio was recorded magnetically. These recorders were very popular until the early 1950s, when metal oxide tape replaced the steel wire. As you can imagine a mile of wire as fine as a hair moving through a mechanical contraption at 2 feet per second can make a real mess if something goes wrong. If you were lucky the wire would break. If you were unlucky it would snarl itself into a miserable tangle. Reels of magnetic tape, and later 8-track and compact cassettes were far more user friendly. While newer magnetic tapes were easier to handle, wire recordings are known to be remarkably stable-- which gets to my interest in this particular machine. The museum has in its collection several wire recordings made in the early 1950s of history lectures given by local people. According to our records we have a recording of Alva Day, one of Martha McKeown, and another about the Spanish American War, presumably by a participant. The reel in this photo says "Nelson, Mar. 14 1954" so it's anybody's guess what it's about. It's my plan to put my EE degree to good use and return this machine to working order so we can listen to these recordings and dub them to digital files. I, for one, cannot wait to hear what Alva Day has to say to us. If any of you have a vacuum tube tester or a tape head demagnetizer, let me know! Arthur, I still have my old tape head demagnetizer you are welcome to use. For reasons unknown to me, the funeral service for John H. Sheldrake, my grandfather and former HR County Judge/Sheriff was recorded on steel tape I believe in 1956. Roger may know the disposition of this tape. Best wishes Arthur on yet another golden project. Arthur, I have both the head demagnetizer and professional quality tube tester that you are welcome to use. Also a good supply of tubes and electronic parts. I had no idea of the existence of this tape or to it's disposition. Sadly there is no family to ask at this late date.